It’s time to bring out the heavy artillery (by which I mean pictures) to explain the effects of the Management Expense Ratio (MER) charged by mutual funds. Fees charged to manage your money are a good example of a death by a thousand cuts. They are barely noticeable over short periods, but are devastating over long periods. For the charts we’ll use a MER of 2% per year. This figure is on the low side for actively-managed funds in Canada, and on the high side for funds in the US. I collected some data from 1950 to the present on the S&P 500 index, the 500 biggest businesses in the US. Any other index, including Canadian stocks, would have worked equally well and would give similar results. Our hypothetical investor, Harry, has $100,000 in a tax-sheltered account. He puts it all in stock funds that we’ll assume perform as well as the S&P 500 (including reinvested dividends) less the 2% MER each year. All returns in the examples below will be real returns, meaning that we account for inflation. The MER in red is barely noticeable. Why should Harry care about eight bucks when his portfolio is swinging up and down by hundreds or thousands of dollars each day? It turns out that the daily ups and downs partially cancel out, but the daily MER costs all point in the same direction: down. Over a year, the MER is noticeable, even on a bad year. This is like watching the height of Harry’s daughter Hanna. Her growth isn’t noticeable to people who see her every day or month, but her grandparents who only see her once a year sure notice the difference. 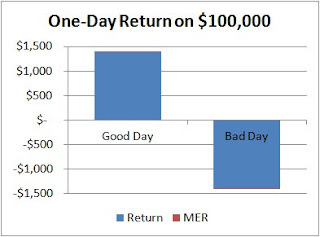 Now the MER really begins to dominate, consuming 44% of the returns in the good scenario and 73% of the returns in the bad scenario. This should make it clear how much damage a “little” 2% MER can do. 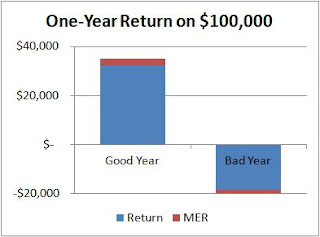 Does that count the loss of future returns on money taken by the MER (ie, total potential gain)? The sad part of this story is that a 2% MER is well below the average for an equity fund. These graphs explain why active management is a very tough game and the odds of out performing index funds are very low over the long term. Richard: Yes, it does. I ran the numbers once with no MER, and then once with the MER. The actively managed mutual funds would have to exceed the indexes by their MER to make investing in them worthwhile. 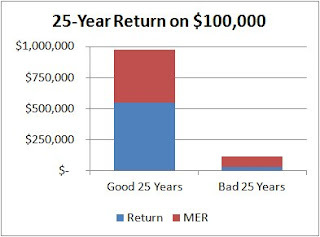 With over 2% in MERs, getting above this in extra returns is very unlikely. Case in point. I was reading the annual report from the CPP Investment Board the other day. These folks are managing over $100 billion in pension assets. The report explains their investment approach, which involves some active management to acquire additional returns above what a reference portfolio of equity and bond indexes would provide. I'm a bit dubious of their active management approach, but the interesting thing is that their plan is to exceed the reference portfolio by 0.6% with 0.2% in additional costs for a grand total of 0.4% in additional return. If these folks aren't claiming to come close to 2% in additional returns, what are the chances for the average mutual fund? Not good. CC: I agree. In the "bad 25 years" scenario in the last chart, a higher MER that is more typical of Canadian equity funds could consume all of the gains above inflation. Blitzer68: It's interesting that the CPP Investment Board are targeting only 0.4% excess returns. That makes beating the index by 2% seem like an unattainable goal. Of course, every active manager has a plan to beat the index, but even if we ignore the MER, only about half of them can beat their index. This means that about half of the time a fund will underperform relative to the index and reduce returns further with the MER. As I wrote in my book, No Hype-The Straight Goods on Investing Your Money, "You pay a lot to own a mutual fund!" Gail: Your calculations would look even worse for the investor if they had taken into account inflation. Anyone who agrees with me must have written a great book :-) You're on my reading list. Please be fair to the ative management side of the debate. The MER problem is not really as big as many of you seem to be implying. In fairness, even index funds have MERs of between one-half of 1% and 1%. You cannot pretend that you could achieve the return of any index without incurring some MER or other transaction costs. Has no investor out there ever beaten an index with some regularity? Dale: I pride myself in being fair when I make my arguments. I'm more interested in learning the truth than I am in being right. It is difficult to convey how devastating a high MER is to investment returns; so, I would say that the MER problem is actually bigger than it seems from looking at my analysis. I'm not sure what index funds you are looking at. I see XIU (0.17%) in Canada and VTI (0.07%) in the US. Add in some trading commissions and you're still nowhere near the MERs on actively managed funds. The universe of actively-managed funds that outperform over a long period of time by enough to overcome their MERs is very small, and there is no evidence that we can predict which funds will succeed. I've been meaning to read this post all week, and finally got around to it. Great post, and those are some real purty pictures there. I heard Jack Bogle give a similar example on a podcast, and every time I hear an example like this, it surprises me. It's just counter-intuitive to think that an 8% return compounded will be so much larger than a 6% return compounded over a 25 year period. I think your charts could be used for marketing purposes by the mainstream mutual fund industry though: "See, the worse we do, the fewer absolute dollars in fees you have to pay!" Michael, I did not mean to impugn your integrity; I believe that you are providing a very useful resource to Do-it-yourself investors, many of whom can achieve better returns than by relying extensively on financial advisor/salespeople. The index fund MERs I was quoting were for Altamira and CIBC's Canadian Index mutual funds. You are quoting ETFs and need to add in buying and selling commissions, unless you advocate buying and holding forever. We agree that MERs are a "problem", especially in Canada where they tend to be higher than those in the U.S. I, however see them as a necessary evil, and I disagree that no one can reasonably predict which funds wil succeed. I lead a group of active-rebalancing/ autumn abstinence mutual fund investors who have achieved average returns of 17% per year, since 2001 untill this year, during which we are presently down 8%. I believe that the recent economic forces that led to a star fund's recent out-performance will typically continue for a reasonable period of time-- (three months)-- thereby allowing us to use a combination of recent out-performance, and long-term performance as a good (but not perfect) predictor of future performance for three month periods. This is often referred to as momentum investing. We rebalance every three months because the short-term trading rules for mutual funds allow this; and if we use a discount broker we pay no commissions or fees,-- except for the hidden MER which we attempt to keep to the minimum, by choosing low MER funds whenever feasible. We also get right out of the market in Sept and October,-- which works well more often than not, -- and which saved our backsides this year. My website is www.octoberstrategy.com. Dale: Let's say that the total cost of a reasonable buy-and-hold indexing strategy is in the 0.25% to 0.75% range. This is about 1.5% to 2.5% better than the typical Canadian stock mutual fund MER. 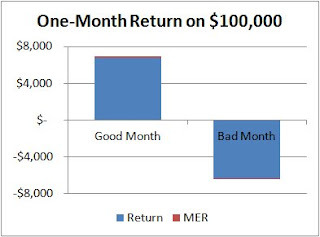 On average, these funds will perform about as well as the index before subtracting the MER. So, the typical investor will lose about 2% each year compared to the index approach. That's about 4% after 2 years, and about 6% after 3 years, etc. I took a look at your web site. I think it makes more sense to quote the average compounded return, which is 15.9% over 6 years rather than 17%. This is still a good result, though. Your strategy seems to involve a fair amount of trading. Do your returns take into account MERs of mutual funds and any fees charged by mutual funds for frequent switching in and out of individual funds? The October Strategy results are my actual real world results, as achieved in my own portfolio -- and presumably replicated by our subscribers -- so they do take hidden MERs --(the necessary evil of our strategy) -- into account. We recommend a discount broker like TD Waterhouse, ETrade, BMO Investorline etc -- and we thereby incurr ZERO commissions/fees or trading costs. Sounds like an interesting strategy, Dale. One could easily enough adapt it to using ETFs for large portfolios where the $9.99 trading fees would pale compared to the MER. Down 8% year to date is stellar performance in this awful bear market. Gene; You could easily do the Sept/Oct "fall-out" as an ETF investor. But I'm skeptical about whether the momentum/frquent rebalancing with ETfs would give you as good a result as actively managed funds. With the ever increasing # of ETFs, this is a possibility, but I am doubtful. Also, are you under-estimating your ETF commission costs? My rudimentary calculations using I-Shares and TD Waterhouse would result in transaction costs of about 1% per year plus their small MER. Gene; When I quoted our 8% year to date loss I was ignoring last week's rout. I just got my Statements. We are now down 15%.